Google’s biggest surprise at its ‘breakfast with Sundar Pichai’ Nexus7/Android 4.3 event was the unveiling of its TV USB flash drive the Chromecast. Priced at only $35, it’s a steal and no wonder it sold out in minutes on the Google Play store and is now sold on eBay for around $100 to wannabe buyers. One of the best things about the Chromecast was that included in those $35 already were three months of free Netflix. This alone would cost $24 making buying the Google Chromecast a no-brainer. 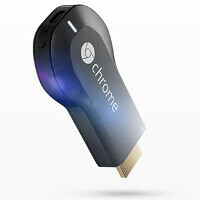 Right now, the Chromecast is sold out on Amazon as demand for the tiny TV streamer is huge. You can still get it on Google Play and on Best Buy. Even without the free Netflix deal, at $35, the Chromecast still seems like a steal to us. What do you think, have you gotten yours already? I may pick up one of these for work. Bought one 30 minutes after it was announced..can't wait to use it! i thought it was a joke,..danm! missed it. I bought on Amazon yesterday morning when I noticed that playstore had a 3 to 4 week wait; glad I did. These things are selling for double on eBay due to the popularity. If your paying for Netflix right now it was a no brainer to get one of these. They are selling for $150 on Amazon also. Google should really give this thing a solid marketing push. And I'm not talking ab out primarily online. This thing is priced right and offers some great features. Yeah I tried to buy one yesterday and couldn't find one anywhere. Got one today with my nexus 7 and got the free three months.